Gaika’s full-length Warp debut opens with a minute of sour and amorphous electronics. It’s a confidently patient beginning for an artist who knows how to write an instant hook. But Gaika would rather set the mood, emphasise the scale. ‘Basic Volume’ is near an hour long, every moment soaked in this tension and ghostly ambience. His futuristic dancehall has always kept the melodies simple and sharp, and the production icy and epic. 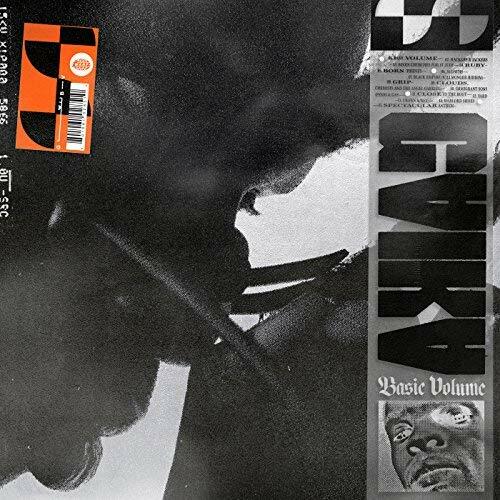 The swirling darkness is so consistent that an hour of material could turn into a pile of gloomy sludge in the hands of a lesser artist, but Gaika flourishes when fleshing out his ideas. Vocally, he constantly shifts his energy, from mournful vocoder-backed crooning to barked staccato raps and eerie spoken word. On ‘Grip’ he digs deep into his lower register for commanding deadpan verses. Two songs later, he’s clear and sweet over a rubbery SOPHIE co-produced instrumental. ‘Ruby’ is perhaps his most powerful vocal performance, a fractured and layered piece built on elegant vocal runs that flow over each other, like an even bleaker, bolder take on the experiments James Blake crafted on his debut. The production is just as nimble, despite its overarching cohesiveness. You could play ‘Crown and Key’ just listening to the kick drums and have an exciting time, and that’s before talking about the incredible build and snarling delivery. All of this meticulousness isn’t without purpose. ‘Basic Volume’ is a haunting picture of rebellion and black existence. Gaika circles around images of violence, spiritualism and black bodies. “Naked and black in a white man’s world,” he says at the end of the opening track, after describing the chaos of inner city life. His lyrics sound even starker under his gothic, weighty production. There’s a host of artists from Travis Scott to Young Fathers who wish to depict the pain, beauty and heft of these topics, and Gaika’s attempts at points may feel eerily like how these topics have already been explored, but it’s in the constant production twists and cracked melodies that Gaika begins to stand out. They’re the features that make ‘Black Empire (Killmonger Anthem)’ so exhilarating, and ‘Born Thieves’ so achingly sad. Over the next few months the scope of Gaika’s debut will only expand, as listeners dive into its rich pool of sounds.